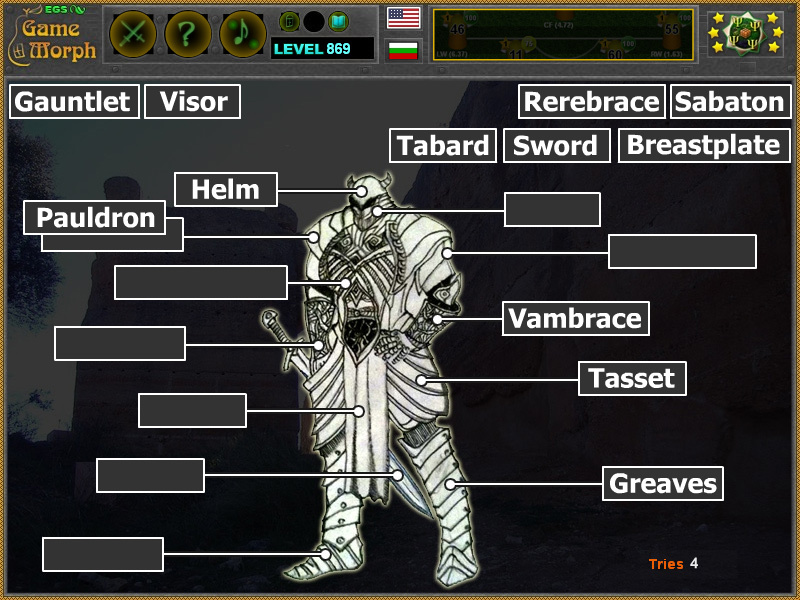 Worrior outfit and knight's armor parts in a fun online history learning game. which may be played in the web browser. Вarrior outfit game. The History Knowledge Board include 12 part names to be fir in the diagram. The game is part of the Interactive Civilization Monuments educational tools. What are the components of the medieval armour? What are the names of the knight armor parts? How to play Knight's Armour Words Puzzle. This is a small drag and drop word puzzle. Place the words in the appropriate position on the medieval knight diagram. Know another 5 medieval armour parts and get +1 Knowledge Level. Class subject: Component names of medieval armour. This small fun word puzzle will test your medieval knowledge in a different way than the previous game. Labels: History Games , Mosaic Games , Puzzle Games , Flash Games , Knowledge Games , Education Games , Free Online Games.